The mink are back. That’s how this was going to start. It was to be a story about the mink taking over the pond. And on Saturday, the day of the Winter Solstice, the day after the world was to end, I went out with the camera. It was a blustery cold day and I wanted to capture the ghost-like swirling wisps of snow that danced with the wind over the pond since I’m not quick enough to photograph the minks. But minutes into my outing, I came across the hard drive from my daughter’s computer. It was laid out carefully on a big rock next to the pond. That’s when the story changed. Hard drive from Marika Warden’s computer lies by the pond that is home to geese, deer, mink and the memory of young Marika.A year ago, the day before Christmas Eve, with almost everything of Marika’s cleared and gone, I decided it was time to take the old desktop computer out of her room. Her friend, Rachel, came over to help. Recycling the computer was a good chore for Rachel; as Marika’s mother, it felt less intrusive to rummage through her underwear drawer than to go near her computer. So Rachel tore it from all the wires grounding it, binding it to the walls and to home, like a million arteries and veins, lifelines that reached out in tangled masses from Marika’s bedroom to the web and the world. Later that day, alone in the Staples parking lot, I knew I was in trouble when, in the process of wheeling the computer-laden cart through the automatic doors, I had a flashback to the year before when I pushed Marika in a wheelchair through similar doors at the hospital. Soon, two Staples technicians, with some effort, operated with screwdrivers and pliers to pull the computer apart, removing screws and panels, following the red, yellow and green wires that wound deep inside the cavernous tower. After a while, they extracted and then handed me the hard drive, a small but surprisingly heavy black metal box. It was similar to the black box back home that contained her ashes. But this one said “Fragile” on it and contained all her letters, snippets and snapshots, conversations with friends, memories, the footprints of my precious pre-cancerous Marika, all locked up inside. It was like holding her heart or her brain. A technician penned in stars, in blue ink on the white label, where I should drill to destroy the contents. That’s when the tears started. On the verge of a major breakdown, I took Marika’s Heart Drive and fled. My son, on his way out just as I arrived home with the somber little black box, offered to blast it apart at his next shooting session. Not able to imagine myself miserably driving a stake through the blue stars on her black heart, and remembering how proud she’d been of her brother shooting a shotgun off the deck during one of her parties, I decided to leave it to him. After all, he needed some closure too. Three months later, on a bright day in the early spring, my son and I placed the little black box at the base of a willow tree and walked back around the pond to his shooting spot. BAM! LikeBAM! All the words, the homework assignments, lyrics to songs, all Marika’s pre-cancer concerns, the pre-laptop laments, the record of life contained in that small black box – LikeBAM! BAM! BAM! There was no fanfare, no fireworks. There was no explosion of computer chips or chorus of hallelujahs. Just two surprised geese taking off fast from the pond at the first of the five shots. We walked back and examined the remains of the box and, satisfied that its contents were indeed destroyed, buried it deep into a muskrat hole that gaped a wide welcome by our feet. 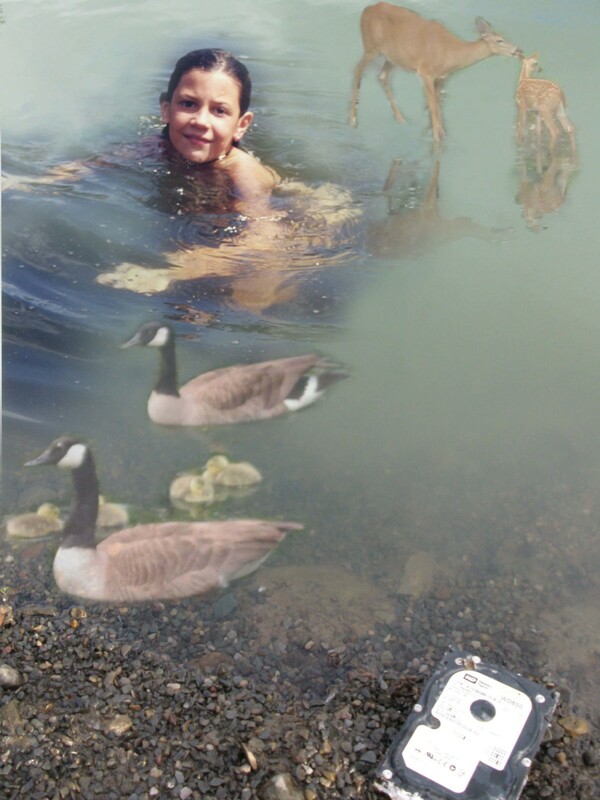 That summer, memories flooded my thoughts: Marika floating in the pond with her friends on colorful “noodles,” the deer and baby geese we watched, pond-side campfires, frog hunts and winter afternoons ice-skating. But I had neglected the pond and I felt bad about it. So, in October, excavators came to gouge out and rescue the leaking, nearly empty pond that was overrun with muskrats and minks. While the excavators dug, I looked in the place under the willow tree where my son and I had left the Heart Drive. The land was riddled with holes and tunnels. I couldn’t spot it. “If you find a hard drive from a computer out here, would you please toss it into the pond?” I asked Paul-the-father and Paul-the-son, the excavators. There was so much mud and mess, I didn’t imagine they’d find it. So I let it be. I never expected to see it again. Saturday, the day after the world was to end, if I’d found Marika herself out there sitting by the pond, the outburst and inner bomb-blast would not have been more emotional. I cradle the sweet box closely. I wail. I laugh. My eyes blur the path as I carry the box of Marika around the pond, gently setting it down in various spots to photograph it, to talk to it. Finally, when I’ve circled the pond, I kiss the Marika Box and throw it as far as I can, out into the pond. It lands with a grand “plunk” right in the middle of where I will swim next summer. Large circling ripples soon reach the edges of the pond. And the floating friends, the fawns, the baby geese and campfires all come back to me. As do the minks. Marika’s pond is filling up. And on the other side of tonight’s longest night of the year, the light grows longer and stronger. This entry was posted in 2012 on 2012/12/24 by Robin Botie.